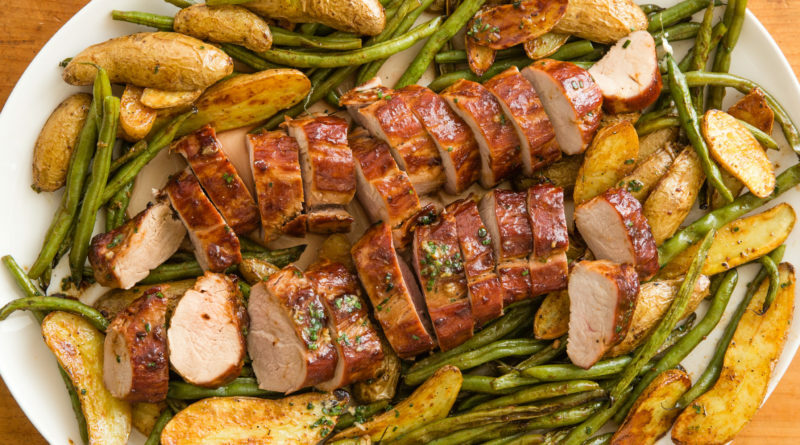 Properly seasoned pork and potatoes are truly one of life’s simple pleasures. If we had to choose one animal to save for a food source above all others I would choose the pig. Easy to feed, tasty to eat, and uh bacon. Combine thyme, rosemary, garlic, salt, and pepper in a bowl. Add olive oil and stir until well blended. Place potatoes in a small bowl and add 1/3 if the oil mixture. Shake to coat and then place potatoes cut side down on a baking sheet. Leave 1/3 of the baking sheet open. Bake the potatoes for 10 minutes while preparing the beans and pork. Coat the beans as you did the pork. Once the potatoes have cooked for 10 minutes take them out and place the green beans on the remaining 1/3 of the pan. Brush all sides of the pork with the remaining oil. Place the pork on top of the green beans. Roast 20-25 minutes or until pork is 145º. Remove the pork to a cutting board. Tent with foil and let stand for 10 minutes. Stir the vegetables, roast an additional 10 minutes or until golden brown. Makes 4-6 servings.